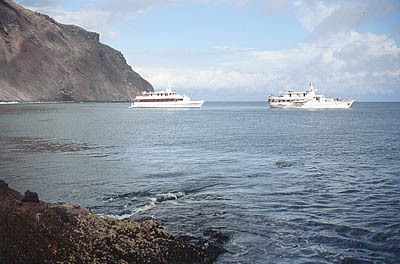 Coral I and Coral II, Galapagos Islands. Subject: RE: INKA'S: HOW DID IT GO? The trip was fabulous. No complaints, except we could have used more time in the Galapagos, as you suggested. Thank goodness we made the effort to get there for the whole 4 days of the cruise. On the way home our flight from JFK to Burlington was not available to us; this probably occurred when we didn't make the first leg of the trip on February 22. I know that Marsha, from AIG Insurance, did her best to see that that wouldn't happen, but it did. That meant a Delta rep had to spend an hour with us to get us on a flight out of LaGuardia. I seriously doubt that Delta made a dime on our trip as that was the only leg they provided. We got home closer to 4 p.m. than the 11:30 a.m. we had hoped for, but we got home before bad weather hit here again. The flight delay in Cusco was probably a good thing as after we changed our plans to the next morning, with Maria agreeing, I went right up to the room and fell asleep for 3 hours! Dinner that night in the ruins was fantastic; thank you so much for inviting Maria and Enrique to join us there. It was magical for me to be there with them, and the boys held up well; they were able to walk a bit in the ruins, as other people were in there. And having Maria with us the next morning, then lunch with her and her family worked out great. I spent the afternoon with Maria and another of her friends from Lima at Maria's house and the guys went back to the Country Club Hotel and enjoyed the afternoon. We grabbed a snack at the Starbucks next to the hotel before the 8:30 trip to the airport. I can't praise the guides enough. In Quito it was a bit confusing, but they did their best to drive us around the city, close to midnight. We saw a lot and then the same two (driver and guide) took us to the airport 5 hours later; they obviously had a long night, but they were pleasant the entire time. At the airport I got to practice my Spanish a lot as there were many lines and rules that were unfamiliar to us, after the guides had to leave us. It all worked out fine. We loved the Coral I and our naturalist, John, and the other passengers were great. We were so sad to leave after 4 days. I had read somewhere that the boat is musty and old; we found it very nice, and the crew was excellent. No wish went ungranted, and we had lots of excursions. Efrain in Lima, Victor in Lima and Manuel, our driver the entire time, were excellent. Efrain is a bit dry, but he was flexible in changing plans after our flight delay, and he took Maria's suggestion to take us to a mall on our way back to the hotel. It was the LarcoMar mall, right on the water, and the boys enjoyed seeing it. It was a good addition to all the ruins we saw, as they could see that life for Peruvian kids (well, some Peruvian kids) is similar to the U.S. Efrain and Manuel had also made an effort our first day to go to a department store and a Radio Shack to buy a charger that had broken the first night. Victor couldn't have been more attentive and pleasant. Eddie and Carlos (driver) made Cusco and the Sacred Valley so pleasant. They were fun and informative. Having Eddie with us in Machu Picchu was just great. I had not had a guide 35 years ago; Sr. Vasquez (Maria's father) did know a lot and shared it with me, but mostly I was on my own in the ruins, where there were no restrictions. This time we saw literally the entire site in the 2 days, and took the excellent hike to the Sun Gate. We also really enjoyed Ollantaytambo and Pisac and the hikes we took to reach those ruins. I bought too many curios/artifacts for Mark's taste! At one point he told the boys we would have to buy a new suitcase. Of course at the next market Nate saw a nice woven bag with llamas on it we didn't buy it!! All of the hotels were also stupendous (I'm running out of original words.) The only one that let us down at all was the second visit to the Country Club Hotel in Lima. The first visit was perfect, but for the second the rooms were quite far apart (not really a problem, because the boys are old enough to be on their own) and at lunch that day we were totally ignored, both the service and the food were sub-par. (That was the only meal out of 5 there that was that way.) It was too bad as Maria had joined us at lunch that day, but she is still thinking of having her son's wedding reception there next fall! There is one thing I'd like to ask you to do for us. Andrew left his wallet (brown nylon, not leather) in either the Sol y Luna or the Machu Picchu Pueblo hotel. Perhaps the Libertador, but I think it was gone before that. The only thing he really needs from it is his Vermont Driver's Learner's Permit. I am going to look into having it replaced here in Vermont, but if you could inquire for us, perhaps they do have it and could send the license to us. Thanks, Martin, for everything. Although it was expensive I can't imagine doing this trip any other way. We saved so much time having the guides and the routes all planned out, the tickets purchased and the parking taken care of. You can't put a value on having someone watch your things while you are off taking pictures or taking a hike. I would not hesitate to recommend Inka's to anybody, especially families with teenagers.